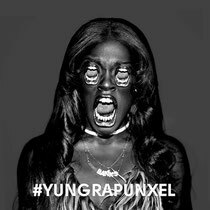 Azealia Banks releases her new track ‘Yung Rapunxel’ today on Polydor Records. Produced by Lil Internet the single features samples from Mary J Blige’s ‘No More Drama’, which Mary personally agreed to clear for Banks. To date Banks has been awarded the prestigious Philip Hall Radar Award at the 2012 NME Awards, totalled up 50 million Youtube views of her groundbreaking track ‘212’, graced the cover of Dazed & Confused and collaborated extensively with Rankin. She’s also released her debut ‘1991’ EP, released a free mixtape for her fans and played an extensive list of shows and festival performances. Banks is currently in the studio recording her debut album which will be released later this year. Check out ‘Yung Rapunxel’ below.